In most European cities, one can find evidence of a strong relationship between the city, its trade links and infrastructure, its art, its people and the waterways that run through it. This is nowhere more apparent than Amsterdam, where the 400 year old canals and bridges of the city’s Canal District have been added to UNESCO’s World Heritage List. 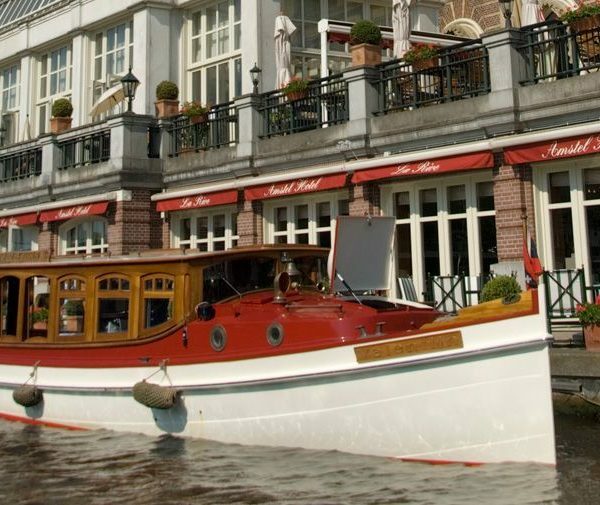 Of the two major rivers that flow through Amsterdam, one – the Amstel – passes directly through the pretty Canal District, and it is on the bank of the Amstel that the Intercontinental Amstel Amsterdam Hotel sits, looking west into the city. 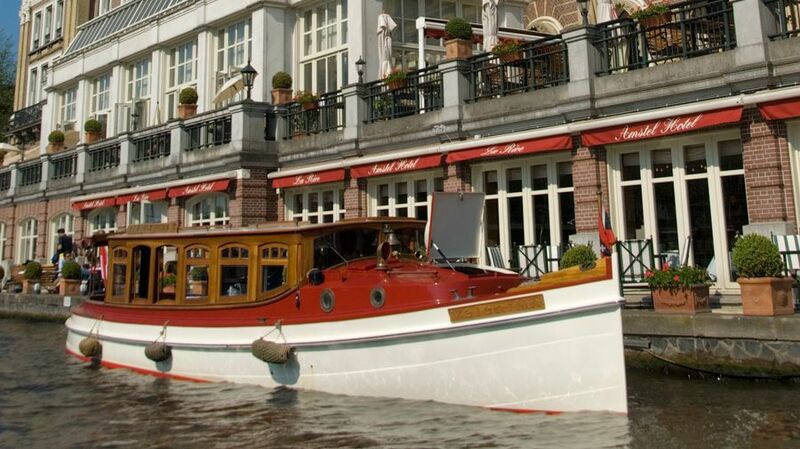 The hotel is a very grand and traditional building, the main entrance of which faces away from the river. Inside the lobby, the classic grandeur continues with white masonry and a sweeping staircase of dark wood. 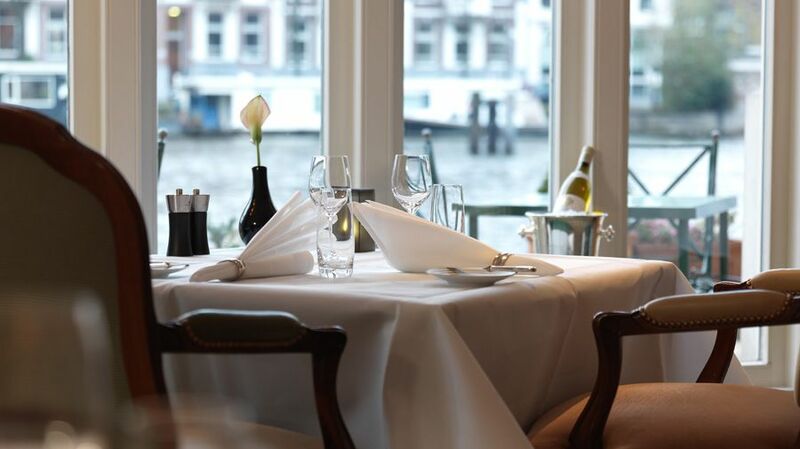 Passing through the lobby and down towards the river, one emerges finally into the glass fronted, Michelin starred restaurant, La Rive (‘the bank’), perched on the very edge of the Amstel. Upon arrival into the restaurant, Charlotte and I were immediately struck by the proximity of the river. The charming Maitre’D, Ronald Opten, showed us to seats right by the window where we could easily admire the city lights twinkling in the rippling water. Having taken a stroll across the city from The Dylan, where we were staying, we felt Ronald’s offer of a glass of champagne was well deserved and, full flutes in hand, we were left to peruse the menu. La Rive has an interesting menu concept. 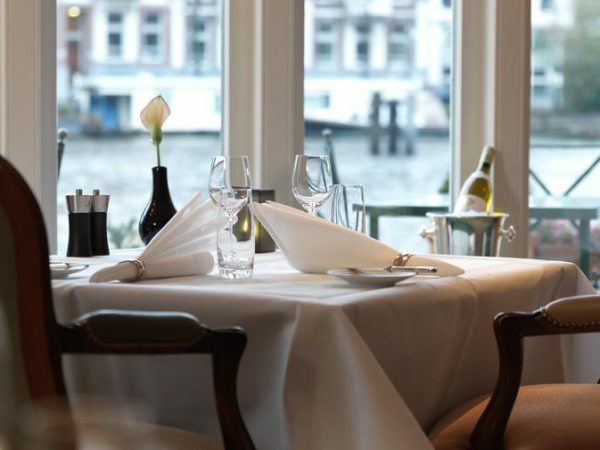 Offering two tasting menus, La Rive Gauche and La Rive Droite (‘left bank’ and ‘right bank’) with either five or six courses, two choices for the main on each, and optional caviar and cheese courses, the chef takes almost complete control over the direction of the meal. This suits me down to the ground; I can sit back in my chair and concentrate on having an enjoyable and relaxed evening, while the chef uses his knowledge and flair to create the perfect culinary journey. After some contemplation, Charlotte and I plumped for La Rive Gauche, perhaps in fond memory of our trips to Paris, where the Eiffel Tower sits on ‘la rive gauche’ of the Seine. While we waited for our first course, we were entertained by Ronald and the sommelier, Ted Bunnik, both of whom were very friendly, with an easy Dutch sense of humour that instantly made us feel welcome. We began with an amuse bouche of mushroom meringues and crisps, as well as a marinated and crumbed tomato with soy and lemongrass. 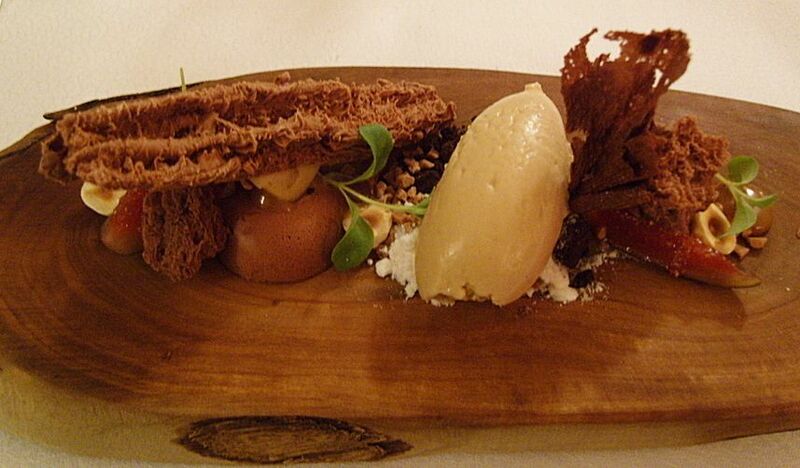 The breads – made in-house, of course – were accompanied by ridiculously creamy cacao butter and sea salt butter, the French-Mediterranean influences that guide the cuisine at La Rive clearly apparent. 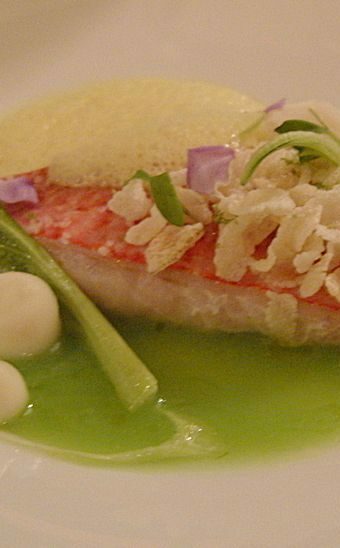 Our first course from La Rive Gauche, a fresh sea bass tartare with sweet crab and tangy wasabi, was masterfully paired, by Ted, with a citrusy Westhofener Reisling 2011 Groebe. We continued with a second white wine, a Condrieu 2009 Domaine du Chêne, that had flavours of apricots and almonds. This wine was paired with a cod dish that also featured quinoa, smoked eel, asparagus and some divine garlicky pearls that added an earthiness to the dish. 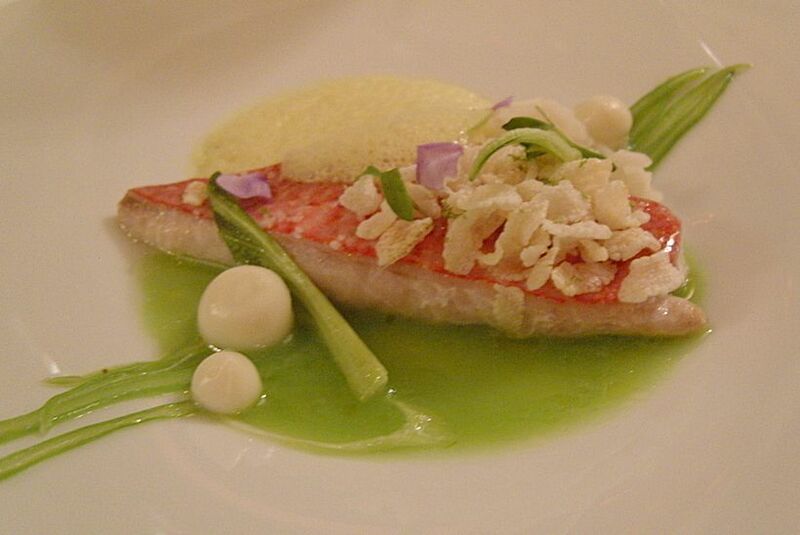 The most unexpected of these seafood courses was the next, an Asian influenced red mullet with pandan rice, Thai curry sauce and green beans. The contrasting pink mullet and bright green sauce had a striking visual effect and each element of the dish was perfectly cooked, creating an interesting combination of textures. These slightly spicier flavours could carry the sweetness of a fruity rosé, and so Ted’s choice of Rosé Parüss 2010 Parusso, with strawberry notes, worked very well. It is unusual to get a tasting menu that provides a different glass of wine with every single course, but Ted, who kept popping up to crack jokes, also seemed to be returning every five minutes with a different bottle. Not to be daunted, Charlotte and I reached this halfway point in the meal before we had to plead for mercy and request a brief interlude. Fortunately, Ronald was keen to introduce us to the lovely Chef de Cuisine, Rogér Rassin, so we took a peek into the kitchen and behind the scenes while our next courses were prepared. Upon our return to the table, we were immediately presented with another glass of wine, a smoky Kuyen 2009 Antiyal and our next course, excellent sweetbreads with a crisp outside and silky, juicy inside, with onion and red beetroot that gave a vibrant red hue to the dish. Of the two main courses on La Rive Gauche menu, Charlotte and I made different choices. 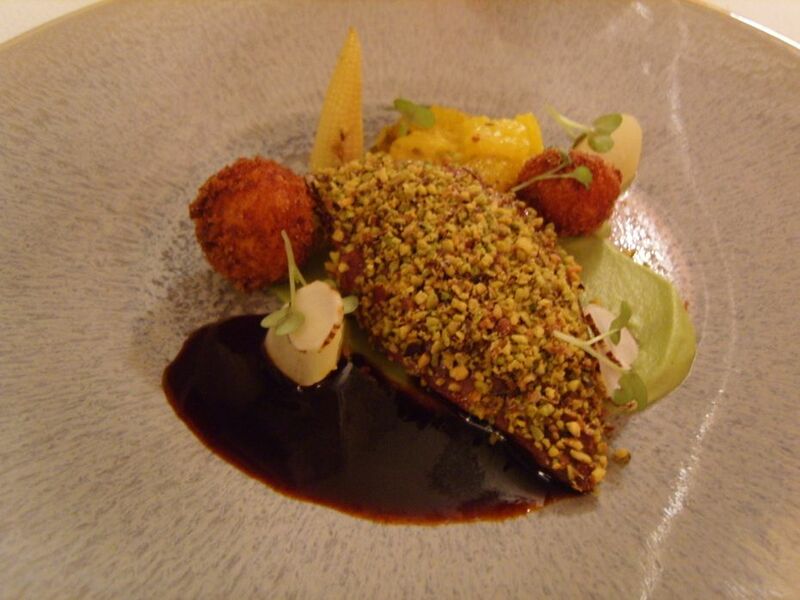 I had succulent Anjou pigeon, with pistachio crumb, salsify and tangy orange, with a jammy Barbera d’Alba 2011 Enzo Bogletti. 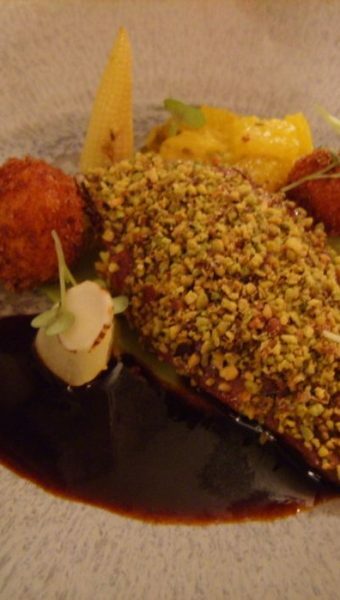 It came with curious deep fried balls, which seemed to be full of polenta and were perfect for mopping up the juices. Charlotte’s wine was a far more rich and robust Chateau Brown 2008 Pessac-Léognan to accompany her Wagyu beef with densely meaty oxtail, Cevenne onion and bayleaf. 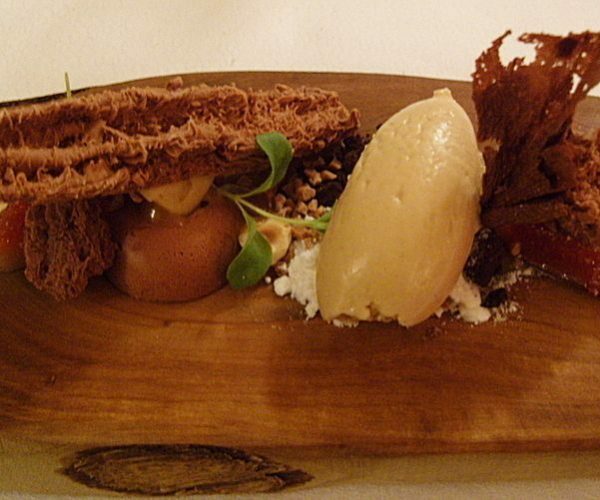 With a wonderful evening drawing to a close, I was very happy to recall that the dessert on La Rive Gauche menu (under the heading ‘Ice cream we all scream for…’, a touch of comedy missing from many Michelin restaurants) was ‘Chocolate’. This turned out to be an intricate presentation of chocolate pieces, figs, hazelnuts and caramel, brilliant for those with a sweet tooth and great with our final pairing, a Muscat Rosewood Vineyards Chambers. Charlotte, however, not enamoured by the thought of a chocolate feast and unable to resist, opted for the optional selection of Dutch farmhouse cheeses with a fine port, instead of dessert. Replete and beaming, we said heartfelt farewells to the culinary team and expressed wishes that our time in Amsterdam could have accommodated another visit. 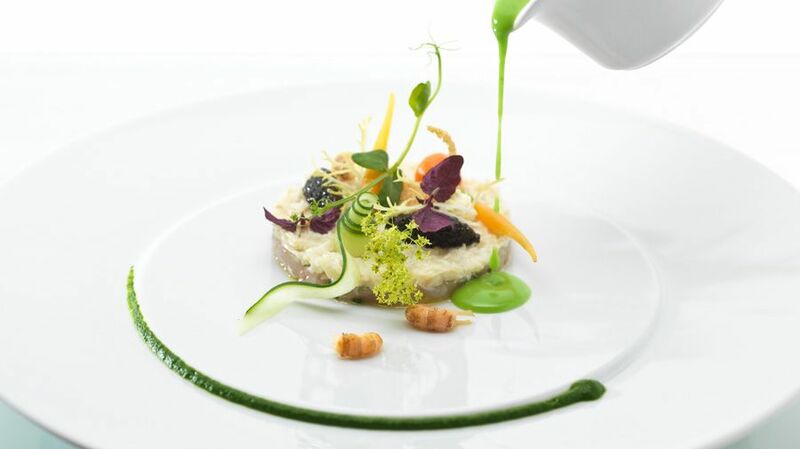 Creating the perfect team for a Michelin restaurant is like creating a perfect dish; one needs to have excellent ingredients, well prepared and presented. Chef Rogér Rassin, with his delicious menu and culinary talent, Ronald Opten, with his ample industry qualifications and bucket-loads of charisma, and Ted Bunnik, with his creative wine pairings and engaging repartee, create a trio of experts that it would be difficult to match. It was this combination of talent that led Charlotte and I to experience one of the most pleasurable dinners of this year – if not of our lives! – and I would highly recommend that you make time to visit when you are next in Amsterdam. 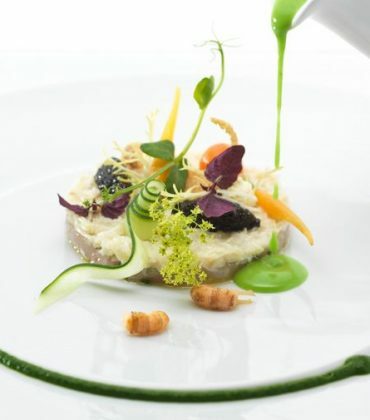 And if you’re wondering whether or not choosing the La Rive Droite menu leads to the same experience of flawless cuisine and impeccable service, I admit I haven’t tried it… but I’d bank on it.